Bucketfeet at 1647 N. Damen Ave.
BUCKTOWN — Two retail shops on the same Damen Avenue block have closed within the past few weeks, creating more empty storefronts along a stretch that's been hit especially hard in recent months. 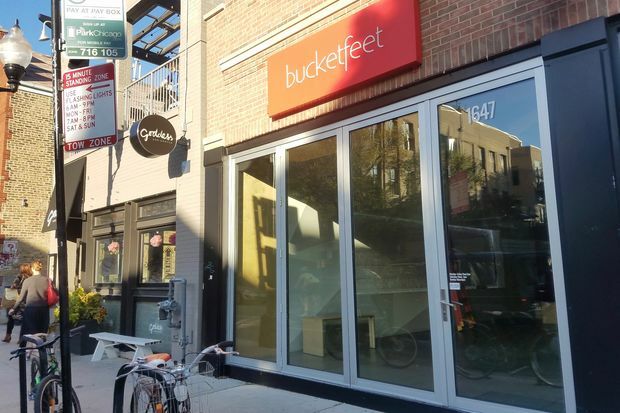 Bucketfeet at 1647 N. Damen Ave. closed Monday, according to a worker at a neighboring shop. Raaja Nemani, BucketFeet co-founder and CEO, did not return a request for comment on the closure. Known for its patterned gym shoes featuring designs from a pool of local and international artists, Bucketfeet opened in Bucktown/Wicker Park in June 2015. Just a few doors south, New York City-based Intermix at 1633 N. Damen Ave. closed Sept. 27, according to a worker at the clothing boutique's Gold Coast outpost. Intermix opened in Bucktown/Wicker Park in 2008. Representatives for Intermix were not immediately available to comment on the closure. In addition to these shutterings, a large storefront on Damen just north of North Avenue has been empty since Feast closed on Dec. 31. Silver Cloud, which shuttered three years ago at 1700 N. Damen Ave., has yet to reopen as a new business and has sat empty at the busy corner of Damen and Wabansia avenues. A "mystery storefront" at 1704 N. Damen Ave. that was renovated for a to-be-announced new store that never opened has added more emptiness to the block. That building was completed in 2015. Buzz Killer Espresso at 1644 N. Damen Ave. closed a few months ago and relocated to Logan Square. The building that housed the coffee shop is scheduled to be demolished soon and replaced with a new retail storefront. Some recent new additions to the block include Real Good Juice Co., which opened at 1616 N. Damen Ave. in August; Sararose, a boutique that took over the former Marc Jacobs; The North Face, which replaced Finish Line at 1629 N. Damen Ave. in September; and Reebok, at 1702 N. Damen Ave., which opened in July. The 1600-1800 blocks of North Damen Avenue, between North Avenue and The 606, are home to several high-end boutiques and shops to which both Wicker Park and Bucktown lay claim.